I am getting a bit of my energy back, so there is no time like the present to give a bit of a crafty update. My Christmas craft-giving list consisted of four projects, two of which I have photos of, two of which I do not because I forgot to take them before wrapping them up (I'm blaming my pregnancy brain on that!). Second, a scarf! Well, actually an ascot. I made the Huckleberry Ascot from IK Holiday 2007 (ravelry link) using yarn I picked up at Rhinebeck - Ellen's Half Pint Farm, 50/50 merino and silk, 220 yards. 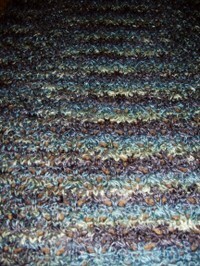 I used one skein, and had just a few yards left over. I did alter the pattern a bit by completing 5 repeats instead of 7. In the end I still ended up with an ascot that was slightly wider and longer than the finished dimensions of the pattern. Third, another scarf! And one I forgot to take a picture of. 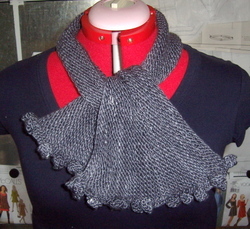 It was a stockinette scarf with garter stitch edging made from Artyarns beaded silk. It turned out beautifully and was a great gift for my grandmother that lives in Palm Springs. And finally, a crocheted cape. More specifically Chanson En Crochet from Wrap Style (ravelry link), which is also available for free from Knitting Daily. I'm pretty disappointed that I neglected to take a picture of it. I crocheted this for my MIL using Lion Brand Wool Ease in Mushroom. It took a little less than two skeins. I picked up a really pretty green button at Joann's as the closure. I made no changes to the pattern, except to change my crochet hook size to accomondate the change in yarn. Believe it or not, that's it. Not a lot of craftiness over the last few months. I do have a couple of things currently on needles - DH's Tribal Sweater (I'm making my way through the first sleeve), a Lace-Edged Women's Hat (ravelry link) to be used as a chemo cap for my grandmother, and a sock that I've had sitting around for months. I do have some sewing planned as well - I'm just itching to make these really cute burp cloths. I have the supplies and everything, it just that my sewing room is currently in transition. More on that later. I was soooo close to being done when I ran out of beads! I guess there is no guarantee that there will be enough beads in the kit to complete the optional tie finishes. So, I contacted Earthfaire and ordered more beads. The necklace is pretty heavy, but there are a lot of beads. It turned out beautifully. 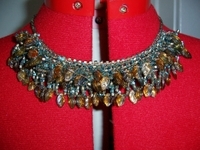 Pattern: Double Drop Leaf Necklace, purchased as a kit from Earthfaire. Yarn: A metallic copper thread that came with the kit. 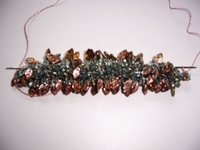 As far as the bead go, I picked the copper leaves and asked Earthfaire to coordinate the rest of the beads. Needles: Innox US00, Double Pointed. At this rate, it will be 52" long unblocked. It looks like Cj's grew 15" when she blocked her's, so with any luck mine will be over 65" long when finished - perfect for the recipient! 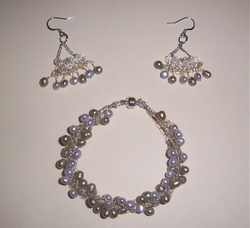 This is the Double Drop Necklace kit that I purchased from Earth Faire last week. Talk about a speedy knit! Including stringing all 1800+ beads, I have spent about seven hours on this baby, and the knitting is officially done. I'm a little stuck on the casting off / finishing directions, but perhaps I'm just over-thinking it (no, not me!). I could not find any errata or clearer direction, so I might just give it a whirl - and if it is wrong and the whole thing comes apart, that's okay - I only spent seven hours on it, right?